The winner and runner-ups of World Mayor 2014 will be chosen based on the number of nominations in relation to the size of their cities and, more importantly, on the persuasiveness and conviction of testimonials received during this year's World Mayor Project. Below we publish a selection of comments received to date about WM nominee Daniel Termont, Mayor of Ghent, Belgium. Comment: Daniël Termont and I have been occupying the position of Mayor for many years. Both of us always had at heart to open our cities to the world, amongst others by becoming members of international networks, carriers of innovation or of commitment to solidarity. Thus, Ghent and Liège were, for example, the first two Belgian cities to join Unesco's International Coalition of Cities against Racism. Both of us also actively support the development of our universities. These institutions play an important role in the identity of the cities of Liege and Ghent. They contribute to the national and international “resonance” and they create an intellectual and economic dynamism which brings essential vitality to a city. Daniël Termont is also, and perhaps above all, a Mayor who listens to his citizens. In order to support this point of view, I take for evidence his support to many popular initiatives in the City of Ghent. A commitment which is also stressed as part of the Smart Cities project, of the Agoria federation, during which he was called to testify on the Ghent experience in January 2014. Comment: Dear jury: I would like to support our mayor, Daniel Termont. There are many reasons why he deserves this title, and here are the reasons I find the most important. Daniel Termont is very much present in the city, walking or cycling, and is easy to approach for a chat. He actually listens and knows what lives in the city. His communication skills are fantastic. He finds the right tone without being patronizing. He communicates when needed, with all kind of means, but he doesn’t exaggerate and is not boasting about his achievements. In Flanders in general, there is a rather negative and conservative atmosphere. Difference of opinion or difference in tradition easily results in conflict, alienating people and putting them into different groups that fear eachother. This isn’t the case in Ghent, and I am convinced that Daniel Termont plays an important part in this. He never ignores or underestimates the importance of a problem for a part of his people, but he never uses problems politically to score easy points. He puts issues in the right perspective and shows he is actually doing something about it, even if that solution is not perceived as a typically socialist solution. He does pragmatically what is needed, and communicates about it in a great way. People in Ghent have the feeling they have the freedom to dream and then have the space to try to make that dream come true. He gives many grassroot organisations the opportunity to start crazy projects and to try out new ways of urban living, urban entertainment, … this open atmosphere makes of ghent a bubbly city, attractive to young people, but never alienating other generations, by keeping good traditions alive as well. Comment: I’m not sure if I’m still in time but I would like to give my support to our Mayor Daniel Termont. He’s a very motivated even more, passionated mayor. He’s threating Gent (Ghent) as his child and is also ruling it as you should raise a kid. Offering enough liberty to explore as a citizen, is open for initiative but willing to step in and deliberate in case of a conflict. He and his ancestor (Frank Beke) made it possible to florish our medium sized Belgian city. He’s aware of the importance of teaming up with the captains of industry in the region and far abroad. I’m convinced that his efforts to build a sustainable network do bring good to all the citizens of our City. I would love to see Daniel as one of the winners of the Worldmayor elections, just as an appreciation for their efforts to make Gent an open, vivid and warm city. The perfect mix between old and new, stimulating all citizens to participate in the project Gent and making us proud to be inhabitants of the city. Comment: In Dutch, we have a nice name for a mayor that fits perfectly to someone like our Mayor Termont. The name is ‘burgervader’, which means something like ‘father of the citizens’. This is exactly what our mayor is to us all. Coming from working class people & having always be in touch with all kinds of men/women, he understands perfectly the needs & aspirations of his co-citizens. I say co-citizens because he sees us (the citizens) as his equals. Mayor Termont also has an eye for minorities and all the problems that come with migration. He's got the knack to create tolerance and understanding between different cultures. Ghent is a really good place to live in: we all feel safe in our town  certainly compared with other cities in the world, we have a very animated cultural life, the city rises to new challenges (such as wastepolicy, greenpolicy)..., it is our city that took the initiative of Veggie days, fruiteating Wednesdays in schools & that are now introduced in all our schools… & we have free pianos in public spaces for people to play on - all these things contribute to a happy feeling throughout the city. That is why our city kept a kind of ‘joie de vivre’ en youthfulness. Comment: The nomination of Ghent for the World Mayor Prize is a great honor and therefore I’d like to participate. I’m voting for Daniël Termont to win the World Mayor Prize; voting for Ghent as it is a beautiful city and voting for the mayor because he understands the value of it. Comment: Ghent is a multicultural city and this is mainly due to mayor Termonts openness for and interests in the several cultures our great city boasts. Moreover, he is very sports-minded and has been the force behind the realization of one of the most advanced and beautiful football arenas in Europe or even the world; the Ghelamco arena. It was given the prestigious title of "moste beautiful football arena in the world" in 2013. The environment is also very high on his list of priorities. The city welcomes cyclists, tries to advocate for limiting the use of the car, promotes public transport, boasts many parks and supports green initiatives. Comment: Daniël Termont deserves to win because he is one of us (the lucky residents who get to live here), he goes to the Buffalo football matches, he loves to party with the people of Ghent whenever he can (on occassions such as the Gentsche Fieste! - Ghent street festival), he turned this city into a masterpiece of design (the famous market hall!). A comfortable town where your bicycle is very welcome. He tries to find the best solutions for all the problems our ever growing city of Ghent faces: influx of many many many many students and many many many many immigrantsnot just from other Belgian villages and towns but from all over the world. We expressed our respect for him, as how he leaded 'Ghentse Festival' and were happy being married by him. Our best persons were also male. Comment: My name is Bjornus and I will tell you in short why Ghent is the best city in the world to me. I come from a place where narrow mindedness and survival in a believe that should seaze to exist reigns. I had the very good luck to come in thouch with this city for the negativity and inhospitality of my home city would have for sure meant my dead. I'd like to say that this city is a modern city and avantgardistic city always in for progression. Comment: I live in Italy now but for one year I’ve lived in Gent. The atmosphere there is lively, the mentality is very open, you feel respected, safe and supported. The city is clean, well organized in all the services offered to the tourists and to the inhabitants, also new comers feel immediately at home there. "Mayor Daniel Termont is a very exceptional person as a human being and as a mayor. He develops in all fields his own vision which he shares and discusses with the stakeholders. But once the vision (and route) determined, he fully engages himself to execute this in a consequent way. A. I am thinking of the design and reconstruction of the city of GHENT, which can be labeled as a great success in terms of attractiveness, esthetics, mobility and functionality. To realize this takes time and investment but it happens in a consistent and consequent way. GHENT has grown from an ugly duckling to a real jewel. B. The mayor is a gifted mediator - both politically and in the bringing people together and get to a consensus between different business interests. He has managed to develop himself and to be accepted as a force that stands above the interest groups , managing to generate and impose solutions. I think hereby of the frequent stoppages in the development and construction of the new football stadium which he helped unlock and actuate again, always a step further until final realization. C. The mayor has and shows an admirable knowledge of his records. He masters files via the key elements. He combines this with a very strong memory, through which he controls a multitude of files from the most diverse nature: City planning, security, fire service, mobility, events, finance, financial management, city promotion etc. In everything we can see the hand of Daniel Termont. Last but not least, he has an incredible work force and energy. He is available from dusk till dawn. Comment: I’m a citizen of Ghent. I do think we have a fantastic mayor. And why? Well very simply because he cares. His citizens are not numbers but individuals. He listens, listens intelligently and always reacts. Every mail you send our mayor is responded within the hour by our mayor! He cares for the minorities, he is very social responsible, he is very intelligent but in the no nonsense way. He is so very well connected with the right people on the right place. Comment: Forty years ago, I fell in love with Ghent. Normally, love diminishes with the years. Not in this case! Ghent became, year after year, more beautiful, with more culture, more events, more feasts. The people of Ghent became more social, more multicultural. Comment: I am Justien Cornelis, 26 years, living in Wetteren (Belgium). 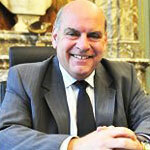 I would like to vote for mayor Termont of Ghent for the world mayor of 2014 elections. - The new stadium (Ghelamco arena) was elected at the world most beautiful stadium of the year. - Every year the city is transformed for 10 days of party. He tries to make the parties available for everybody, as they are in this times of EU crisis, still for free (free entrance). - He gives a lot importants to culture, amusement, touristical attractions and nature in his city. - Ghent is a student city. I was myself a student in Ghent. It is a really nice city to study. We have our own region to go out, our own 'homes' and our own sport facilities. Every student loves it, and this could only be achieved when the mayor himself is very student minded. - He loves his city and appreciates all the values the city can give him (historical buidlings, cultures, nature,...). He really made the city more touristic. Recently it is stated in many USA journals that Ghent is "the most beautiful city in the world". This is an important achievement of our mayor, we really respect his city. Furthermore, he wanted the everybody, every tourist, could enjoy all the beautiful Ghent could offer. Comment: Ghent runs trough my and mr Termonts veins a bit like our two rivers Leie and Schelde who flow together in the middle of Ghent.Our mayor Termont is within our town! On a sunny or not so day you can see him riding his bike to meet his inhabitants or attend some cultural event in one of the many city areas of Ghent. Comment: I know Daniel since we were involved together within the young socialists, 40 years ago. Comment: I am Hui Zhang, Female, mayor of the city of Weihai, Shandong Province, China. I would like to take this opportunity to vote Mayor Daniel Termont, Ghent, Belgium, for the World Mayor Prize. The first time I met Mayor Termont was when I visited Ghent in September 2013. Before that I had heard a lot about his industrial dedication from my colleague, Mr. Sun Shutao, who visited Ghent earlier in 2012, as CPC Secretary of Weihai, and I witnessed his devoting spirits when one night I saw him still working at the City Hall by 11 o’clock, which impressed me deeply. Mayor Termont placed high emphasis on developing cooperation and friendly relationship with cities of other countries. He shows the advantages of Ghent especially in education and high-tech industries to the world and is always ready to share the experience of urban planning and renewal of his city with other cities. With his keen interest and strong support, our city of Weihai signed sister-city relationship agreement with his city of Ghent in September of 2013 during my first visit to Ghent. Two months later, the two cities signed Letter of Intent on EU-China Urbanization Partnership witnessed by the Chinese Premier Li Keqiang, and Mr. Barroso, President of EU committee in Beijing. In early July, 2014, Mayor Termont and his delegation visited Weihai and his visit was successful. We held Weihai-Ghent Economic Cooperation Seminar and Urbanization and Renewal Seminar; his delegation visited Harbin Institute of Technology and some of the major enterprises, and also they toured my city and visited several factories. All these activities deepened the mutual understanding and made the two cities find more potentials in cooperation and mutual development. Comment: Termomt Daniël is de beste Burgermeester die ons al overkomen is een Ghent. Hij is een goede vriend al jaren toen mijn man nog in de in de gemeenteraad zat,van een andere partij, zegde hij Daniël word ooit de beste Bugervader van Ghent. En dat geeft hij intussen al ruimschoots bewezen. Helaas geeft mijn man Deconick R. Niet kunnen mee maken, hij zou fier geweest zijn op zijn op zijn Ghent met Daniël Termont als Burgermeester . Comment: I think Daniel Termont should become "Worl Mayor 2014", because no city in Belgium has ever had a mayor, who is so passionate about his city. Termont is always so friendly, helpfull and he loves to be around the people of Ghent. He has made Ghent to a warm and social city, where every inhabitant loves to live. Without Termont, Ghent would never be the same, nobody wants another mayor anymore! Comment: I'm living in Ghent for 15 years now and I really love this city. I like it so much that I gave up my job at the federal government to come work for Digipolis 5 years ago. Digipolis takes care of the ICT infrastructure of the employees of the city of Ghent. In my opinion Termont has led this city in the right direction. Citizens of Ghent love living in Ghent and are really proud of it. It is Mayor Termont guided Ghent towards what it is now, and will probably keep doing this for a long time. Comment: I was born and raised in Ghent and still live there now. In fact I also work for my wonderful city. I have travelled quite a lot. To different continents, different cities all over the world, met a lot of people. So, what difference does Termont make? • On every occasion, whatever decision (either popular or unpopular, makes no difference) he has to speak up for, he tells which good goals (for the good of all) are behind it. He explains the choices made. • He speaks about the people of Ghent, no matter if they are originally African, Chinese, … he unites ALL THE TIME!! • On hard subjects, such as dealing with Roma groups, he (against the mentality of racism and fear) says the things that are being done (justice-wise) to keep occasional problems under control, but mostly stresses how we, as a city, as a population should be open and welcoming to anybody who needs it. He doesn’t create intolerance, what many many many others do. Because it’s easy to say ‘everyone else is bad, better choose my side’. But he refrains from that. • Every now and then he makes time to go from house to house, meet ‘his’ people and listen: what are their problems, how can the city help them? • He comes from a hardworking, low social class family himself. He hasn’t got an ego that makes him feel better than anyone else. He’s human, like all of us, and doesn’t try to make anyone believe anything else than just that. • He explains difficult matters in simple words. He doesn’t hide behind terminology. Comment: I support Daniel Termont because he is a man with a vision, a vision about the world, about Ghent and about what a big, but livable, city should look like. And he succeeded in creating it. He is charismatic in his very own way. I don't know anybody who doesn't like him as a mayor. I hope he will be elected the world's best mayor because he is. He deserves this title. Comment: Ghent is widely known for being a warm city. This is not only thanks to the people of Ghent, but in no small part also thanks to their mayor. All of the good things you can say about Ghent are also true for the personality of Daniël Termont. Warm and genial, plenty of stories to tell and concerned for everyone’s wellbeing. Daniël Termont is a man of the people, who also looks at the world around him with a keen eye. He has managed to instil an international flair in his city, without it losing touch with its people. He works for the 250,000 people of Ghent as though he were in charge of a small town of 2,000 inhabitants. Daniël is one of the few politicians who manage to both tackle the high-level problems and listen to the minor and major concerns of his fellow city-dwellers. While he is busy drawing up a long-term vision for his beloved city, at the same time he will get personally involved in fixing the broken tiles of a sidewalk, reorganising the garbage collection or settling a neighbours’ dispute about an overhanging branch. There is no one better than Daniël at practicing the art of what we call in French ‘une politique de proximité’. This is the key to building up a close and genuine connection with your residents and therefore a successful local policy. Comment: I would like to nominate Daniel Termont, mayor of Ghent, as the world's best mayor. As I am a citizen of Ghent I think I am well placed to do this. Mayor Termont is very down to earth, responds to e-mails and text messages from citizens himself instantly, while devoting every minute of his time for the city and its inhabitants. He knows every area of the city, comes from a social neighbourhoud himself and worked his way up with his easy-going, no-nonsense style and approach. Our mayor has a great sense of humour and speaks the local dialect perfectly. Apart from that, he made Ghent one of the most popular, ecologically friendly and nicest places to live. Making the center of town a car-free zone is a very good example of how a once not so popular measure is now excepted and applauded to by everyone. Our mayor has the guts and the will to change things for the better, even if it could effect his popularity. But in the long run all citizens benefit from the measures taken. Comment: Well done in nominating Daniel Termont on the shortlist of best mayor in the world. He is (and so was his predecessor) a socialist mayor in the true sense of the word. Comment: I think I can be very brief in telling you why Termont deserves to be the best mayor of the world. Ghent is a city that embraces pluralism, not only by words but also by deeds! Instead of being scared of other cultures, the city of Ghent tries to foster other norms and values. Comment: I would like to support my mayor, Daniël Termont, because I think he should be voted best mayor in the world. I myself live in G(h)ent, so I have very good reasons for supporting Daniël Termont. • Firstly, as I noticed you knew, Daniël Termont was elected to reside in the Flemish Parliament, but didn't want to do so, no, he wanted to stay mayor of Gent, which is truly what he is designed to do. • Secondly, Daniël Termont spends every Sunday going to the homes of those people, who have filed a complaint about anything during the week. He personally goes to their homes and talks to and more particularly with them. • Thirdly, he really is the "mayor" of Gent, nobody speaks as the Gent dialect any better than he can, everyone knows and loves him because of that (even when people from outside of Gent can't understand him entirely, they still "fall in love" with him). At this moment, the president of the party Termont belongs to, is sharply critised and he will probably have to take a step back. Daniël Termont is named as one of the (possible) successors, because he lives for the people (which is truly an admirable feature and matches the original party's foundations). • Fourthly, Daniël Termont is always approachable, and if not he himself, he always make sure that your complaint/question/whatever is dealt with. Comment: I vote for Mayor Daniël Termont as World Mayor for many reasons. Comment: I usually never vote for elections like this, reading in the newspaper Mr Termont is nominated on the shortlist however, I decided to support his nomination and take a few minutes to motivate myself. Living in Flanders, a part of a complex Belgium. There have just been national and regional elections, showing the main differences between the southern and northern part of Belgium again. In the north people tend to vote very right wing, supporting a party that wishes to let go of Belgium and make Flanders independent. The southern part votes left wing, wishes to remain one nation. An exception in this voting behavior is Ghent, a city in Flanders. There will be several reasons for this difference. Ghent is a student town where many young people tend to stay. Most of them vote left wing, they vote according to their ideals and the kind of society they wish to live in. A society that is liveable for all kinds of people, a society that puts a lot of effort in those who are weaker. The father of this party in Ghent is Mr Termont. I believe his personality, the ideals he stand for, and the way he engages himself are reasons why Ghent has a totally different voting behavior than the rest of Flanders. Comment: I have been living in Ghent for over 30 years and have to say that I’m very proud of my city and Mayor Termont. Thanks to his efforts and policies Ghent has been a place to enjoy the city-centre. He has revalidated open spaces in the centre, made the centre of the city a nice and appealing place to be and live. Being the 3rd biggest city of Belgium (I know, we’re small and not that densely populated)… we still are a city in which you can get a ‘hello’ from a stranger in the streets. We talk to the stranger sitting next to us on the public transport (admittedly, not all the time). And once a year we have one of the biggest street fairs in the world, with free shows, concerts, workshops etc. Thanks to this positive climate/attitude in the city you feel safe and criminality is low! Comment: Daniel Termont should definitely win, because he’s the mayor who changed Ghent from being just one of the cities in Belgium with historical interest into what it is today. It’s alive and kicking ! You must have heard about all the awards and references in travel guides. But that is just one part of the story, in the mean time he is the person who tries to establish a social coherence, everybody is proud to be a “Gentenaar”(inhabitant of the city). Comment: This may be a rather strange story but I believe Daniël Termont should become the best mayor and that for the next story. We're talking 2012, just after an electoral debate for the local elections (between Termont and other candidates) at the end of August. (Elections were in October). The debate took place in the suburb Oostakker in a local youth center. At that time I was working in Desteldonk (a mile from Oostakker and 9 miles from my house). I used to take the bus to Oostakker and then the bike to work. But my bike suffered from a puncture so I took the bus to the debate. After the debate I noticed that I missed my last bus and had to walk home, 8 miles, that is around 2 hours. After 1 mile I decided to try hitchhiking and the first car stopped. It was Termont with his Volvo. I told him my story about the puncture and he even made a detour on his route between the debate and his residence (in suburb Mariakerke) to drop me off near my house (near suburb Nieuw Gent). Comment: I grew up in Zwijnaarde, on the outskirts of Ghent and studied in Ghent, many, many years ago. I visited Ghent late May - early June this year. I was happily surprised about many things, but above all, about the signs I saw of the town being governed in a sensible way, appropriate and necessary for this century and the survival of our species: the right emphasis on public transport, bikes and pedestrians in the historical and commercial centre of town, and respect for the social needs of a town, recognizing that multiculturalism is the only acceptable way forward. Comment: I was born in Ghent in 1953 and saw many Mayors passing by. They all changed the city for the best especially the infrastructure of this beautiful town. However Daniel went further than infrastructure and services alone by personally and militantly keeping an eye on the social tissue of Ghent by advocating for the wellbeing of its weakest and most vulnerable citizens for the benefit of the whole city. By pro-actively fighting exclusion of all kinds of etnic and non etnic minorities and by being a servant for ALL. Comment: Daniël Termont is de enige gemeentelijke politicus die er in geslaagd is in een provincie hoofdstad in Vlaanderen, een breed progressief front te vormen door de ecologisten van GROEN, te laten samengaan met de Sociaal Democraten van de SP.a. Hij is ook de enige politicus die zich 'samen' met een Vlaamse en Belgische politicus van allochtone afkomst op één affiche toonde om dat progressief project te promoten, tijdens de meest recente gemeenteraadsverkiezingen (2012). Comment: Daniel Termont should be elected 'best mayor' because he is much loved by the inhabitants of Ghent. He is 'a man of the people', he says the right things on the right moment. One small example : I saw one speach of him live 2 years ago : When my son was having his 'spring celebration', the ritual at 12 years when they go out of primary school (catholics do the 'communion', agnosts like us do an alternative)(many of us in Ghent). In Ghent there are a couple of hundred teenagers celebrating this ritual in an aula at the university. There are several speeches. I remember that the speech of Daniel Termont then, was one of the headlines for my son and his friends : directed to the youth, with nice examples, and wicked humour they understand. It was so nice to see the effort of Daniel to be there, to talk to them, and to inspire them. Comment: I am a resident of Ghent, and it would be great to find out that my mayor would be the best in the world. For me he already is the best in the world. He feels what the man in the street wants/needs. Comment: I was born and raised in Ghent. With this email I would like to tell you about our mayor Daniël Termont. He is a man of the people. Whenever you write him a mail, or you contact him in any other way, he always respond and try to help you when you have a problem or he answers you when you have a question. I work in the educational sector and when we organise projects in our schools, he is always willing of helping us to motivate our children. He does that by visiting the schools, or sometimes we get to film him in his office where he challenges the kids to participate in the project. The way he communicates with people is very natural, open, correct and friendly. People love him, that's for sure. You can tell it because, every year in January, he gives a New Year reception for the Ghent people. Thousands and thousands of people come to celebrate with him. When he gives his annual speech, it is humorous and, of course, he speaks in the real Ghent accent. • He is as a Mayor like a Specialist Surgeon  his knowledge of the city  its problems/its needs/its advantages etc… he knows his city and the people  and like any good Surgeon  he takes all things in consideration  that is why 80% of the Ghent people gave his their vote  no importance of the political preferences. • Also like a Specialist Surgeon, he knows when to STOP  he knows his strengths , and he does not go further then what he thinks is the best for the city  and what he is capable to do, he doesn’t get seduced by taking more taskes in Belgium Gouvernement but stays trough to what he is as a personne, and is able to do  he knows his limits and that is a great Strenght! • We have because of his team the most beautifull Football station in the world  we have our “Gentse Feesten”  we have a city that is full of creative people  we have Peace! - his wits, they are extremely disarming. - his “hands-on” politics (he used to be a popular salesman of household-electronics and pots and pans (or something like that)): result is what matters but it can do no harm having fun while achieving it. Comment: I vote for my Mayor because he both puts the lively city of Ghent on the world map (top 10 ranking in Lonely Planet ) and he does a lot of effort to give everyone who arrives in Ghent a warm welcome. Using small projects among neighbours makes the Turkish community communicate with the other immigrants, ranging from Antwerp ( as myself) to China. Comment: Ghent has proven over the last decade that it's capable of dealing with the present day problems of a city that sees new economical potential and yet also has a historic integrity to maintain. The government of Termont has acted efficiently to achieve these things. It also continuous a tradition of openness and tolerance towards other cultures. This tolerance stands in contrast to the more and more right-wing political landscape in most of the rest of Flanders. In Ghent insecurity about new elements in society is met with dialog, conscious-making and stimulation. In other places politicians all too often try to sooth the public with vague promises of more security, without actually tackling the root of these thus perceived conflicts of cultures, which is the lack of a common frame of reference. Comment: I would like to take this opportunity to vote *against* Daniel Termont. I have two reasons for this. First: Under his mayorship the so called 'stadshal' was erected, a three-million euro structure in the historic heart of the city. The initial communication regarding the project (UNESCO was not informed), its location and aesthetic pleasantness have been repeatedly challenged, but my main issue with this project is that the wood from an endangered tropical tree (afromosia) was used. Should Termont become world mayor, this would be a signal that it is OK to plunder the world's resources for local benefit. This is a violation of the very first article in your code of ethics. Second: Termont has adopted the policy that students form a nuisance for 'real' inhabitants and that student housing should be moved to the outskirts of the city. The homes they currently rent should instead go to young families. This will be accomplished by an additional tax on renting rooms to students. I object this policy because it unfairly places students in a bad light and ignores the benefits the student population brings (spending in the local economy, cultural events, reduction in car use, ...) As a student I also have experienced first-hand how the commute in and out of the city is, and it is far less pleasant than how Termont represents it in every interview and debate on the issue. Of course most students cannot vote in local elections, while young families can.